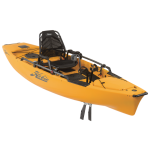 At Kayak Fishing Supplies, we have been paddling, pedaling, rigging and fishing from kayaks for over 20 years. We know a thing or two about what a quality fishing kayak is all about. So we do not carry just any fishing kayak you can find out on the market today. We make every effort that we only offer the best and the most popular brand and models. 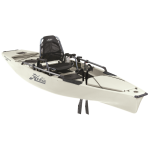 The selection of fishing kayaks at Kayak Fishing Supplies will be top of the line and made by manufacturers that we stand behind in quality and customer service. They may differ in size, weight, and array of features, but they have one thing in common - they are all proven, and the most popular platform when it comes to kayak fishing. You will notice Packages associated with most of the kayak brands. What we try to do is bundle together the kayak of your choice, as well as the most common accessories. We offer it all together with a discount, and you get a "turn key"/ready-to-fish vessel the day it arrives. A lot of people who are just getting into the sport get intimidated by all the choices, skills and knowledge involved in properly rigging your fishing kayak. With our Kayak Fishing packages, we make it worry free for you. Our staff has the training and experience to safely install any electronics, bait tank system, or any other kayak accessory - and installation of all these accessories purchased with your kayak, or as a part of the Kayak Fishing packages is free! Let us build your Kayak Fishing machine today- want to change/add from our kayak packages, no problem send us a wish list and leave the rest up to us!